Tonight, one of the most talked about Heavyweights on the planet, David Price will take on the tough, Matt Skelton. Skelton has got good credentials, he has won British, Commonwealth and Europeans titles, as well as challenging for a world title. A prime Matt Skelton would be a good fight for Price, but at forty five years old, Skelton is not the same fighter he was five or six years ago. But having said that, it's Heavyweight boxing, Skelton is on a good win streak, and Price's chin is untested. I think Price will win the fight, and win by eye-catching Knock-Out, but Skelton will come to fight, just like McDermott and Harrison did. 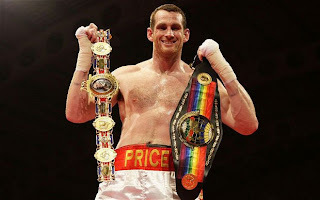 I don't think we will see anything different from Price, if he takes on Dereck Chisora or Tyson Fury, we will find out how good he really is. This should be a routine title defence, but like I said earlier, it's Heavyweight boxing and anything can happen.